For Honor is soon due for a major update with Marching Fire, and everyone’s getting a chance to play with the new features ahead of release. The open test more or less doubles as a free weekend before the big update, letting you get in on the action whether or not you own For Honor. The Marching Fire open test begins September 6 at 5:00 PDT / 8:00 EDT / 13:00 BST, and will run until September 10 at 14:00 PDT / 17:00 EDT / 22:00 BST. You’ll be able to preload the test on September 4 via Uplay, and though the test will also be available on Steam it doesn’t appear there’ll be any preload option there. You’ll get access to all 22 warriors in the open test, including the existing Knights, Vikings, and Samurai, as well as the new Wu Lin fighters – Tiandi, Jiang Jun, Nuxia, and Shaolin. You’ll be able to play in both the 1v1 Duel mode, as well as Breach – the new castle siege game type being introduced in Marching Fire. The three Breach maps – Walled City, Hallowed Bastion, and Kazan Castle – will all be playable in PvP, PvE, and custom matches. This will also serve as first look at the new perks system, the newly-revised dialog, improved visuals and UI elements, and a new victory celebration screen that adds a bunch of poses to celebrate your wins. Marching Fire properly launches on October 16 for $29.99 / £25.99 / €29.99. 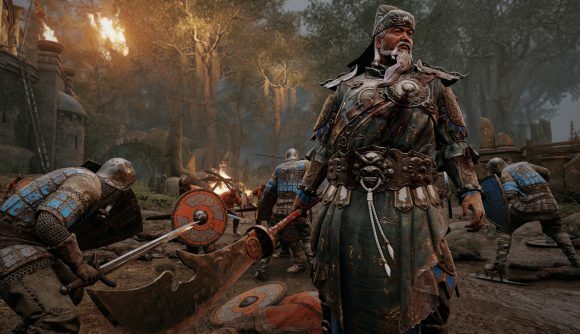 That grants access to the new Arcade mode and unlocks the four Wu Lin heroes two weeks before everyone will be able to get at them with in-game Steel purchases. For Honor player counts have continued to hold strong since the game was given away for free last week, so it seems players are finding plenty of reasons to stick around. Hopefully Marching Fire can continue to improve the game’s long-term prospects.